Today is a day that I really need some comfort food. Whenever it’s cloudy, rainy or cold I think of my mom’s soups. 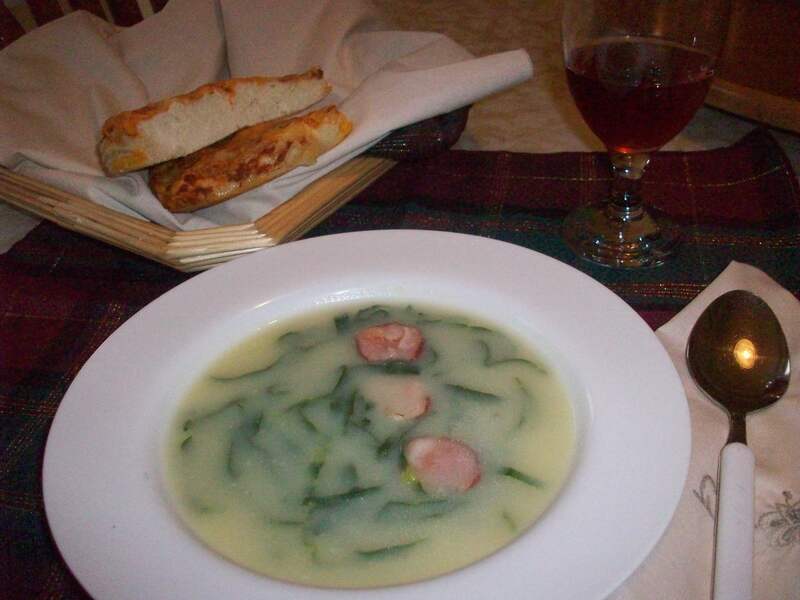 My mom has so many soups that I am learning to make, one of them is Caldo Verde, but the chorizo is optional. I like making the vegetarian version as well. Here’s the recipe, and enjoy ! Extra equipment: a hand blender. 3 large-sized white potatoes, peeled and sliced in 1/8 sized pieces. 1) I fill 3/4 of the pot to about with water, add my potatoes and 1/2 onion cut in a few pieces, 1 tablespoon of olive oil and let it boil at medium heat. 2) About 20 min. later add your bullion and let it dissolve, add your salt, pepper. 3) Turn the stove off. Let it cool about 5 minutes or so. 4)Then with your handblender, blend the potatoes with the broth, until you have a cream of potato consistency, it will be a smooth-thickness consistency. 5)At this point add your thick sliced collard or kale, and some parsley, and a few pieces of sliced fried Chorizo, begin cooking again on low heat for additional 10 to 12 minutes. 6)When the collard have softened turn the oven element off. Take a taste test after the soup has simmered down, and add your garlic powder or additional black pepper or pimento paste to taste. 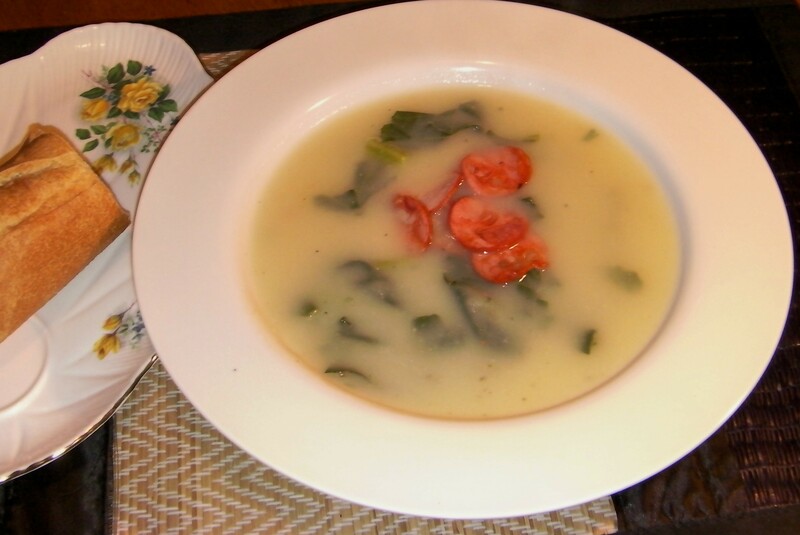 Really simple soup dish and so healthy for you. 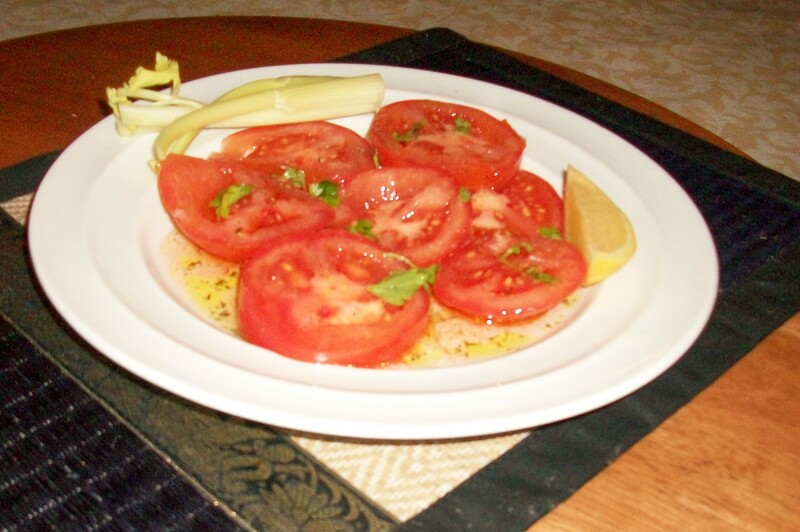 I eat it with a piece of baguette bread or any good European style bread, with a side of sliced tomatoes for afterwards. For me, it’s a meal in itself. Let me know what you think and drop me a comment, thanks. Cooking time 1 1/2 to 2 hours. 1/2 of medium onion, diced. 1 sm. pinch of parsley (optional) towards the end. 1) Wash the Octopus and cut in bit size pieces, set to the side. 2) Saute the diced onions and sliced garlic cloves with the olive oil in a deep medium pot. 3) Add your Octopus pieces. Pimento paste (sweet), the Bay leaf, 1 tsp. of cumin, pinch of black pepper. 6)Second half of the cooking, add more water, about another 3/4 to 1 cup water. 8)Lower the heat to med. low, until the water lowers down to a runny gravy like texture. Great sides are Portuguese white or yellow corn flour bread. Portuguese seafood, meat and soup dishes tastes so much better with a good piece of bread. My favourite one is Portuguese Style corn bread, the perfect complement. Although this bread is made in various European households, I grew up with this bread in my household all the time, but it was made at home, not bought at the bakery. When I was a little girl of about 5 or 6, I remember watching my Dad in the kitchen, rolling the dough into the size of a cantaloupe. He would be so involved in the process, unaware of his surroundings as if he was pouring his soul into the bread. It is really remarkable to watch someone really enjoy making bread. He must have been thinking about his life back home in Portugal or the anticipation of eating his creation; perhaps reminiscing about his mom making the same bread and watching in the same appreciation as I did. 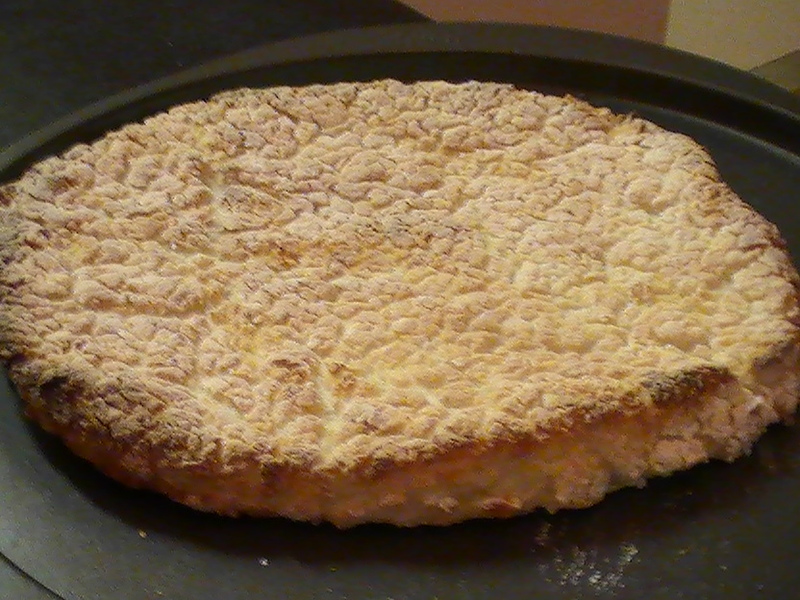 Nobody can make this simple, tasty bread better than my dad….until now. Time to hand over the tradition Pai, (Dad in Portuguese), your daughter will carry it to the next generation. The only downfall is that this bread doesn’t keep long, 2 days max, and for a somewhat frugal cook, I’ve got to love it to go the extra mile and make it. Yet it is so easy to make, for busy people it’s definitely a weekend baking treat. It is a staple in my home now, even though my kids eat bits at a time. Given the right dish, like shrimp in a wine sauce (one of my future posts) they would dip the plates clean. May you enjoy this favourite of mine. Cheers ! 1) Pour 2 cups of corn flour, pepper and salt, dash of garlic powder, sugar (and 1 tsp. of dried Rosemary herb optional) in large mixing bowl. Add 1 1/2 cup of hot boiling water and stir with wood spoon until thick and well mixed. Consistency should be thick with minimal lumps. Let the dough cool about 20 minutes at room temperature; or outside with a towel covering it; or in the fridge for 10 to 15 minutes. 2) In the mean time, prepare the baking surface with the extra flour dust on a rectangular or round baking pan. Preheat the oven to the highest heat, mine goes to about 550 degrees farenheit, and that’s where I set it. 3) Now roll your sleeves on this part and of course clean hands. Take bowl out of fridge and add the 1/2 cup of white bread flour into dough and blend with your hands. It will be sticky, but the goal is to knead on a floured surface, and not make it sticky. Roll into a nice ball like the shape of a cantaloupe. Then Flatten the dough to the shape of a medium oval pizza shape, with the thickness to be about an inch to inch and 1/2 . 4) If you have a large flat spatula, carefully slide it under to scoop the rolled out dough on the flour dusted baking pan and place it on the baking pan carefully. 5) Bake until bread is deep golden brown on top, usually about 1/2 hour to 40 min., but have the light open in the oven so you can spot check after 20 minutes to see how it’s doing. Once its a nice light golden brown, remove from oven. Wait about a minute or two and wrap with a clean tea towel so that it keeps it’s moisture and won’t go dry on you.